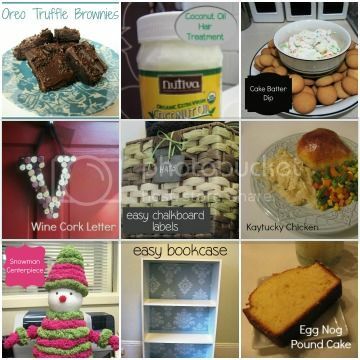 Still going strong with the resolutions – two weeks in a row with a post! As an aside, Grace and I are both loving Instagram. My username is sborden86. Grace’s is gvk506. Feel free to follow us. We've been taking pictures of pins we’re attempting, among other things. Okay so back to the business at hand - I pinned these Pretzel S’mores from Love from the Oven last week and couldn't wait to try them out. I thought they looked so yummy & easy. And other people must have too, because the second I pinned it, it was immediately repined 20 times. Christi had melted her marshmallows in the microwave but mentioned the oven may work as well. So on my first attempt, I tried making them in the oven. I figured I could fit more pretzels on the baking sheet then on a plate in the microwave. I used Jumbo marshmallows and cut them up. I used half for each pretzel. Then I put a bit of chocolate on top. I used a Hershey’s dark chocolate bar. I figured I didn't need too much chocolate since I was going to dip them in chocolate anyway. I put them in the oven at 350 degrees for 4 minutes. The results were far from ideal. The marshmallows puffed up way too much and poured over the sides. The chocolate slide right off – it was a disaster. So I decided to cut down the amount of marshmallow I used for each pretzel and use the microwave. I used a quarter of each jumbo marshmallow and microwaved them for about 15 seconds on medium power. Once I took them out of the microwave, I placed another pretzel on top of each one. This time the marshmallows didn't puff up too much. However, the chocolate didn't melt enough, making it difficult to place the second pretzel on top. 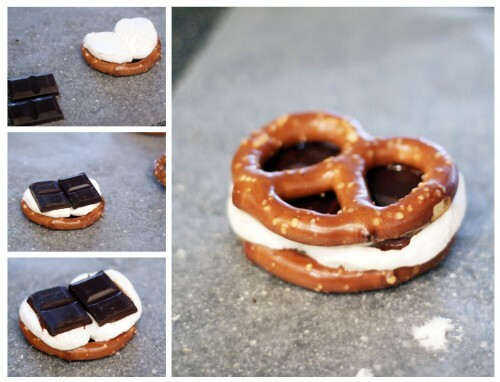 The next and final step is to dip the pretzel s’mores in chocolate. While I was melting the chocolate for dipping, I stuck the pretzel s’mores in the freezer to harden up for a few minutes. I dipped half the pretzels in milk chocolate and half in dark chocolate. I threw some Valentine’s sprinkles on some just to make them festive. Once the chocolate is hardened, you are all set to enjoy! I was bringing these to a friend’s house so I threw them in a Valentine's Day tin I picked up at CVS. Isn't this tin cute? I was surprised they sell this stuff in CVS. The Verdict: I wasn't too impressed. The marshmallow/pretzel/chocolate ratio just wasn't working. It was difficult to balance the chocolate bars on top of the marshmallow before heating them up. Also, the marshmallow didn't taste that great coming out of the microwave. It doesn't have that same great campfire taste. All in all, they were a lot more work then I expected for not great results. I mean, don’t get me wrong, I definitely ate a bunch (can’t let them go to waste after all!) but I probably won’t be making these again. Christi’s looked great though, I was probably doing something wrong (as per usual ha). Things to Note/Consider: One big mistake I made was not putting wax paper down on the plate I used to microwave the marshmallows on. They were very difficult to remove from the plate when I was ready to dip them. If I was ever to make these again, I would maybe try using marshmallow creme or fluff instead of actual marshmallows or perhaps try them in the oven again but on the broil setting. Like s'mores? Check out the S'more Cups Grace tried a few months ago. Thanks Ruthie! We will definitely stop by.